Nom, nom, nom, nommy, nom, nom. That’s what I say when I get to eat Italian’ish food without fear of winding up on the pot. By Italian’ish, I mean “What people in New Jersey eat,” and it’s awesome. My time on the east coast was luckily gluten-filled, so I got to know the joys of the chicken Parm and friends, even though I had to say “ciao” once I got the old celiac diagnosis. Every now and then I get a huge hankering for the old, bread-crusted days and whip something up. 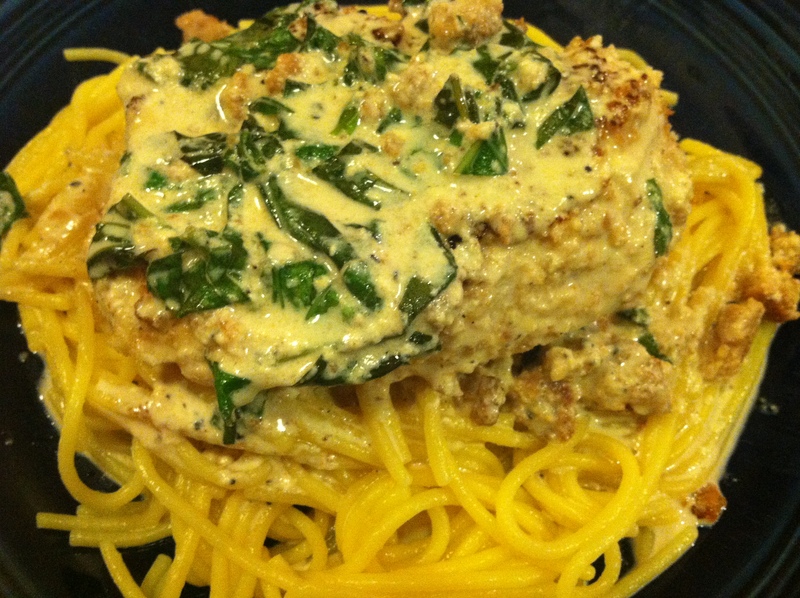 This something, is a gluten-free creamy basil chicken over pasta. And it freaking rules. RULES. I just grabbed my Trader Joe’s gluten-free corn spaghetti (which has rapidly become our family favorite) and toasted some Udi’s to make bread crumbs and I went to town. To town, I say. It’s a shame I didn’t have some gluten-free crusty bread to sop up the cream here, but that would require some kind of crazy act of god and gluten, so I enjoyed my carbs in gluten-free spaghetti form. Damn, I miss crusty bread. Anyhoo. 1. Place milk and gluten-free bread crumbs in separate bowls, big enough to add chicken breasts. Dip chicken in the milk then coat with bread crumbs. 2. Bring water for spaghetti to boil while chicken is cooking. Prepare spaghetti according to instructions. 3. Heat skillet on medium heat, and add 1/2 of the butter. Add chicken to skillet and cook on each side for about 5-10 minutes (depending on the thickness), putting the rest of the butter in skillet to melt right before you flip to the other side and cook for 5-10 minutes. 4. Remove chicken and cover to keep warm. Add gluten-free chicken broth to the skillet and bring to boil. Add cream and allow to boil for one minute. 5. Reduce heat, add Parmesan cheese, basil, and pepper and cook until heated through. 6. Serve chicken on spaghetti, pour sauce over the top. Tags: gluten free recipes, gluten free spaghetti, gluten-free italian food. Bookmark the permalink. This sounds amazing. If it stops snowing, I may have to go to the store to get ingredients! I’m with Amanada on this, it sounds so good! It’s funny, when we first went GF my husband and I were “meh” about corn pasta but now we really like it. Mrs. Leepers is a good brand (fresh direct delivers it) but that’s only because I’m too lazy to drive to Trader Joes. I have a recipe from Living Without for Soft Dinner Rolls that I ABSOLUTELY LOVE. Blows other GF breadstuffs out of the water and I’m going to use it to make my own hamburger and hotdog buns because it has the right “mouth feel” to it. It’s not crusty bread, but it’d do in a pinch. Ooooh. I’m a gonna’ try that. And Dana, yeah, I hated corn pasta at first but now it’s my go-to. WEIRD. The rolls are awesome. Just made them Tuesday with the “Flax egg” (have made them both ways) and used them tonight as buns for burger sliders. DELISH!!! Perfect texture.